Experience will be key for Galion’s boys tennis team. 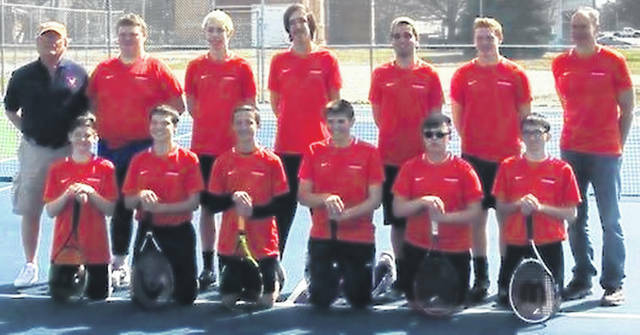 GALION — Galion’s boys tennis team will look to christen those refurbished courts in Heise Park this season. The team is coached by head coach Tom Pawsey and assistants Terry Gribble and Alan Conner. The Tigers are looking to improve on their 4-11 mark from a season ago while also getting over the hump of losing several close matches. In 2018, the Tigers finished near the bottom of the regular season standings while netting themselves a fifth-place finish in the league tournament, tallying 13 points while champion Clear Fork Colts racked up 24 team points. Gone for the Tigers are Tyler Harris and Max Papenhausen, who played their way to a first doubles championship last spring. Eight players return for the Tigers, Weston Rose and Kurt Ensman in doubles, who will provide the senior leadership; juniors Alec Dicus (doubles), Kodin West (doubles), Alan Evans (doubles) and Chris Amick (singles or doubles). Additionally, Jack Wright (doubles) and Zach Grimes (singles) return for Galion for their sophomore seasons. Three freshman are are being expected to contribute: Matt Gimbel, Jamie Hollis and John Evans.